Federal Reserve notes, better known in commerce as U.S. currency, paper money, or bills, are the same size and weight regardless of denomination. 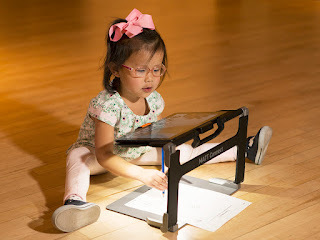 Because there is no tactile difference between a $5 and $20 bill, for example, individuals who are blind or visually impaired may experience difficulties denominating them. The Department of the Treasury’s Bureau of Engraving and Printing (BEP) is working to change that, and is taking a number of steps to provide meaningful access to U.S. currency for those with vision impairments. In January 2015, the BEP launched the U.S. Currency Reader Program to provide a free currency reader device to all U.S. citizens or legal residents who are blind or visually impaired. The currency reader is a small, compact, hand-held device – about the size of a credit card and about one-half inch thick. To use the currency reader, one simply inserts a U.S. bill into the reader and presses a button. The device quickly identifies the bill’s denomination in one of three ways: a clear natural voice, a pattern of tones, or a pattern of vibrations for privacy. The vibration mode assists people who are deaf and blind. 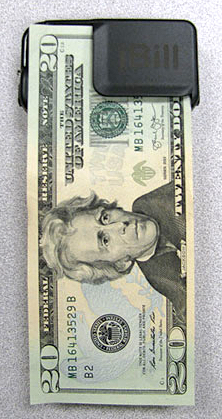 The currency reader identifies all U.S. currency in circulation, to include the $1, $2, $5, $10, $20, $50 and $100 denominations. It runs on one AAA battery, which is included. Through an interagency agreement, the National Library Service for the Blind and Physically Handicapped (NLS) is supporting the BEP by administering the order fulfillment and processing functions of the U.S. Currency Reader Program. NLS currently administers a similar program that provides free braille and audio library materials to U.S. residents and citizens living abroad whose low vision, blindness, or physical handicap makes it difficult to read a standard printed page. To request a currency reader, individuals must mail an application form, which can be filled out and downloaded at http://www.bep.gov/uscurrencyreaderform.html . The applicant must provide verification of their visual impairment by having the form signed by a certifying authority such as a doctor or by attaching verification documents issued by a federal, state, or local agency. Applicants who are currently registered patron of NLS can simply check a box on the application and no further certification is needed. Completed applications can be mailed to U.S. Currency Reader Program, 14th & C Streets, S.W., Washington, DC 20228. The BEP has contributed to the development of other technological solutions that allow individuals to determine a note’s denomination by using their smart phone or other mobile devices. EyeNote®, first introduced by the BEP in 2011, and the IDEAL® Currency Identifier, developed in partnership with the Department of Education are two mobile device applications available for individuals to download for free. EyeNote® operates on the iOS platform and is available as a free download through the Apple App Store. The IDEAL® Currency Identifier is designed for use with Android phones and can be downloaded for free from GooglePlay. Both apps utilize a continuous scan function and use the device’s camera to recognize a Federal Reserve note. The note’s denomination is quickly communicated back to the user. Other accommodations to provide meaningful access to U.S. currency are being developed as well. The U.S. government is researching the addition of a raised tactile feature to the next redesigned Federal Reserve note and will continue to add large, high-contrast numerals and different colors to each redesigned note denomination that it is permitted by law to alter. More information about the meaningful access program can be found at http://www.moneyfactory.gov/resources/meaningfulaccess.html. Apple iPhone users also have an additional option for currency identification. The LookTel Money Reader App, available in the iOS and Mac app store, reads currency quickly and easily. Many users report that LookTel recognizes bills faster and is easier to use. The app costs $9.99, and I can state from experience that the app is stable, reliable, and accurate in its reading of currency. We welcome your comments on the iBill or any of the apps listed in this article.